Generation Y epitomise the term ‘digital natives’, they have grown up in a world where they are surrounded by technology, technology that has developed at a faster rate than ever before. Subsequently, every move they make is punctuated by technology and gadgets are as much a part of their life as food and toilet paper, but this can help as well as hinder the generation. A worldwide survey discovered that 90% of Gen Y check their emails, texts and social media accounts using their smartphones before they even get out of bed. The same survey also found that, globally, one in five Gen Yers will check their smartphone at least once every ten minutes. This apparent ‘obsession’ with technology comes, in reality, from a desire to ensure they aren’t missing out on anything. This is why a Gen Yer will often seem as though they are surgically attached to their smart phone, and, although some may say that this is a distraction from work, it can be a positive for employers. Gen Y are, by far, the most agile, responsive, and informed generation thanks to their internet use, smartphones and other gadgets. In an employer’s eyes a Gen Y worker will have a natural ability to connect and communicate, as well as respond quickly to information. 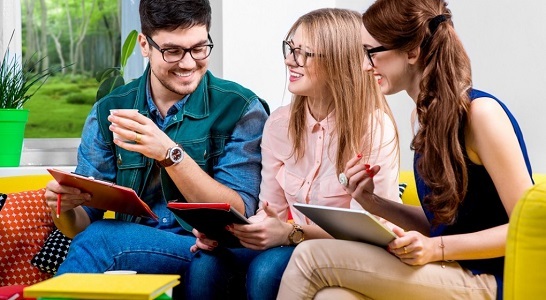 The question then is; are Gen Y well connected, or are they technology addicts? The survey found that 60% of people questioned checked their devices for emails, social media updates, or texts compulsively or subconsciously and 60% of the compulsive users stated that they wished they didn’t feel so compelled to check their devices. Interestingly, 40% of the people surveyed said they would experience a withdrawal effect if they couldn’t check their device. The use of technology continues with over a third of users surveyed admitting that they had used their smartphone in the toilet, and one in five admitted to texting whilst driving. Apps are also an important part of a Gen Yer’s life too apparently, with 70% of respondents stating that mobile apps were important to their daily life. There is also evidence that Gen Y do everything online, from shopping, to reading the news and watching television. It’s clear that Generation Y and technology go hand-in-hand and this can only continue to be the case for generations to come. *Statistics taken from the Cisco Connected World Technology Report 2012.